With the equivalent of 6 full time staff, the Gold Museum relies significantly on its 80 volunteers to carry out many tasks, both dealing with the public and behind the scenes. Through the support given by the volunteers, the Museum is able to provide additional services to the public and to improve the accessibility of the historical collections. The Gold Museum Society was formed in 1991 to provide practical support the Museum in a variety of ways. Members are involved in giving guided tours of the Museum, assisting with recording, indexing and researching the historical collections, and promoting the Museum in the wider community. Volunteers are encouraged to work on projects in their own areas of interest. For example, transcribing goldfields diaries, cataloguing the geology collection, or creating a database for historical maps. One member is currently writing biographical notes on people featured in a large photographic montage of Ballarat pioneers. The Society is led by an elected committee, with a President, Secretary, Treasurer, Guide Coordinator and a number of committee members. Members commit to at least two hours of time a week, and in 2013 Society members collectively contributed around 5,200 hours of service. The Society conducts monthly meetings, and has additional communication through a monthly newsletter called Aurum. Back issues of Aurum are available for download below. 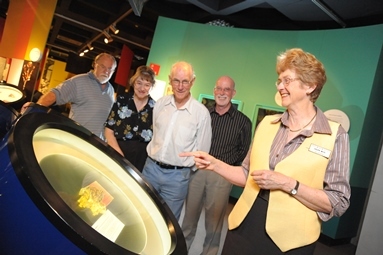 For enquiries about joining the Society, please contact the Volunteer Coordinator at the Gold Museum on (03) 5329 2319.